Many people decide to leave London because of the traffic, the pollution, the noise, the frenetic pace of life that sometimes just doesn’t suit a family or a couple entering retirement. Perhaps you’ve visited Vila Nova de Gaia and envision spending all your days there instead of just a quick vacation. You’re not alone, then. With a romantic name like Vila Nova de Gaia and a perfect location between the Rio Douro and the Atlantic, who could blame you? But turning a favourite vacation destination into a new home isn’t always as simple as it may seem at first. Hiring a professional moving company London is really the way to go to ensure a safe and smooth transition. At Moving Service we offer a long list of removal services London to Vila Nova de Gaia that are particularly designed to answer the needs of a wide range of home removals. From a studio flat to a three-storey family home, we’ve got you covered. No matter what types of furniture and how many packing boxes you’ll be needing, we can get the job done, and all at a great low price. Call 020 8746 4402 now for your free quote. 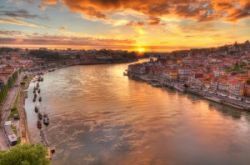 Vila Nova de Gaia is just across the River Douro from the larger city of Porto in northwest Portugal. It is quite a large city by Portuguese standards, with nearly 200,000 residents within the city limits and another 100,000 or so in the surrounding area. Vila Nova de Gaia is often called simply Gaia and is part of the Porto Metropolitan Area. The region is a popular tourist destination for lovers of Port wine, which is stored in caves, also called lodges, to be aged. Be sure to visit the Museu do Vinho do Porto (Museum of Wine and Port) across the Douro River from Gaia, especially if you are a wine enthusiast. There are many things that attract people to Gaia other than Port wine, particularly its 17 km of coastline containing 17 beaches. Many of them are Blue Flag beaches, meaning the water quality is particularly high. Valadares, Granja, Aguda, Miramar and Madalena are just some of the most popular ones. Other than wine and beaches, the city of Gaia has much going for it in terms of historical and architectural attractions. 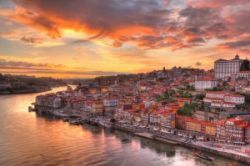 It was once part of the Roman Empire and was formerly called Cale, and what was once a thriving city was at one point abandoned for the nearby Porto during the Moorish invasions around 1000 AD. It was resettled and was given the name Vila Nova de Gaia (meaning new town of Gaia). The new town sprung up around the remains of the plundered castle of the old city. Spending a week or two vacationing in Vila Nova de Gaia might be enough to convince you of its pleasures and attributes, but when you are ready to move for a longer stay, be sure to call a professional house mover London to Vila Nova de Gaia to get you there safely. Moving Service can provide you with everything you need, from packaging materials and boxes to transport services from a man with a van or a large moving lorry. To find out exactly what you need, simply call us up on 020 8746 4402 for a free quote and advice from the best London house movers around. We guarantee your satisfaction when moving London to Vila Nova de Gaia, so you’ve got no reason to wait another minute more!